The Israeli Defense Force mounted a botched raid in Gaza. They were attempting to install surveillance gear, which they ended up leaving behind. (There are photos -- scroll past the video.) Israeli media is claiming that the capture of this gear by Hamas causes major damage to Israeli electronic surveillance capabilities. 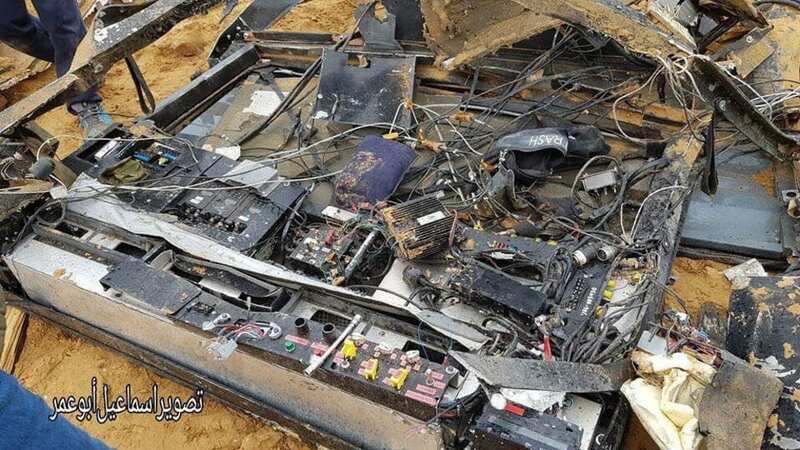 The Israelis themselves destroyed the vehicle the commandos used to enter Gaza. I'm guessing they did so because there was more gear in it they didn't want falling into the Palestinians' hands. Can anyone intelligently speculate about what the photos shows? And if there are other photos on the Internet, please post them. lots of tracking scripts on this page I most say is all in hebrew only one useful photo worth studying. If it is intelligence-related hardware, nobody with actual knowledge will tell you anything useful. I note that the pink labels seem to be in Hebrew (hard to see w/ the photo resolution), and I find it doubtful that a device intended to be installed in enemy territory would have labels in Hebrew. It would surprise me a bit if this actually shows the surveillance hardware, since the only parts I can actually identify look like a socket for a comm handset (Something like this http://heb.sysdo.net/images/product/38_1.jpg) and there are way too many output options for something that should collect information. I can see some self made control boxes with 80s style switches and what looks like labelmaker labels. Other stuff is obscured, but you usually don't control computerised equipment with those switches. Desert condition/ruggedness requirement might play a role, but even then one might expect newer tech, especially with the connections the Israeli have. I'm not sure what kind of system that is but it looks either antique or amateurish. The only label I can read says "TRASH". I have to assume its correct. I can not in all honesty advise anyone to look at that page. It basically wants you to be tracked in oh so many ways it would not be sensible to do so. I do not know what Israeli organisation is behind the web site, but it strikes me as odd that if these photographs are so sensitive to Israeli National Defence, then why would a reputable Isreali orgasnisation be putting them out there? Something tells me there is a large rodent behind this somewhere. Is it a news website or Mining website? NoScript add-on blocks it. Maybe the devices were left as bait to a trap, that may involve browsing to these web pages as part of the exploit. Sub threshold sound communication? Or some other covert channel between devices and web pages? I am Israeli and I can confirm that walla.co.il is a legit news website that is very popular here among the general population. Quite possible that the site owners are collecting and selling info about visitors, but I doubt it's an Intelligence services front. Many sites here are just horrible and obnoxious. The photo of the guts of the device is at a resolution just low enough that nothing is really legible. I am pretty sure that the pink label furthest down and to the right is composed of two words, the second of which is "SWITCH" (upside down relative to the camera). WATCH: Footage purportedly shows Israeli forces striking targets in the #Gaza Strip. Reports indicate that an Al-Qassam brigade commander was killed in an Israeli operation earlier this evening. Breaking Israel News also has an article about a $38 billion defense aid bill drafted by the U.S. for Israel. The article says, “The bill would give Israel increased access to sophisticated U.S. technology to ensure it maintains its qualitative edge in the region through the U.S. war-reserve stockpile in Israel, which Israeli forces can use under certain conditions.” From what I can tell, the bill (the “U.S.-Israel Security Assistance Authorization Act of 2018“) has passed both chambers of Congress, but is still awaiting the president’s signature. Israel’s commercial ties with China have flourished under Binyamin Netanyahu, the prime minister, who met President Xi Jinping in Beijing last year (see picture). In the first eight months of 2018 Israel sold $3.5bn-worth of goods and services to China, up 63% compared with the same period last year. China accounts for a third of the investment in Israel’s impressive technology sector, said Mr Netanyahu last year. The prime minister will host Wang Qishan, China’s vice-president, for an “innovation summit” in Jerusalem on October 24th. At the same time, the generals have been blindsided by Binyamin Netanyahu, the prime minister, who has just proposed his own “IDF 2030” programme, envisaging more spending on long-range missiles, cyber-warfare and intelligence gathering, instead of beefing up ground forces. Mr Netanyahu, who served as a commando officer 50 years ago, has often expressed impatience with the large armoured divisions of the regular army, and has always wanted more cash for sophisticated intelligence, special forces and the air force. With regards the photo you link to it appears to be a welded sub-chassis for a vehicle of a "standard form". What type of vehicle is not clear but at a guess I'd say for the likes of a medium sized delivery van. If you look on the left you can see what looks like three semi-secure VHF or above radio systems of the sort that are fairly standard issue to military / police forces around the world for doing forward FATC for airstrikes. Such kit usually runs on ~28V not the typical car and small van 13.8V. Which might account for what looks a commercial DC-DC converter (black heatsink white/silver lable) to the lower right of what could be a purple cussion. To the right of that there is what looks like an "auto fuse bank" with the orange and red plastic fuse holders. Under that is a black box with a similar one to it's right at 90degs. The yellow plastic that is visable appear to be protective plastic caps you get on high end high rel connectors when you buy them. In between is another box of a similar form factor to the radios, but it's not clear what it is my guess is it's a crypto or store and forward unit. My guess is that the two black boxes are for "sensors" to be connected to and these then get multiplexed up into what could be a semi custom crypto-unit or store and forward unit. Below and slightly to the left of the purple cussion is what looks like a central control box for the radios. The red switch cover is one of those oddities you see around equipment for mil use. Because it has a a dual function, which is to stop the toggle switch underneath it getting either accidentl knocked into a different position, and also stops mechanical vibration you would expect from off road or similar vehicles. If you move down from this towards the front you will see a bunch of white connectors that are almost universal in cars and light commercial vehical wiring harnesses. What they are designed to "pickup with" in this case is not clear. To the right of the white connectors are another bunch of rotary and toggle switches that look like they are designed for "high current" switching and one lable appears to have "12" on it suggesting that this part is for power supply switching. Without better photographs there is not much more you can say. But if I was to make a guess this was designed for an unmaned "park-up unit" which could be interogated by either a helicoptor or plane using standard 40-70MHz VHF or 400MHz UHF equipment, which would mean little or no suspicion would be raised for standard military personnel servicing such air frames etc. Hint to anyone publishing photos wanting to know "what is this thing". Use a macro lens and get close enough to see the labels on each component. Given enough of those a knowledgeable person can pull the datasheets and infer what the rest of it is. The vehicle shown in the lower three photographs is completely burnt down. There is not a single piece of plastic left on it. Such a fire usually leaves traces in the surrounding but there are no stains nor ash from the fire on the ground. Also there are bushes/twigs next to and below the vehicle which are not burnt, which I find odd. The tires in the last photo are half hidden in the dirt. Park your car, set it on fire and look if it digs itself in by 10" just by burning. Presumably, the location in the photographs is not the place where the vehicle actually burnt down or the photos show a wreck that burnt a couple of years ago. The plastic on the supposed surveillance device is more or less intact. If it is still part of the vehicle in this photograph, then there shouldn't be any cable insulators, plastic switches, printed labels left. This piece cannot have been part of the vehicle during the fire. Was it perhaps expelled by an explosion before the fire actually started? The device itself does not look like it is the origin of a violent explosion because it is rather intact. These things aside, why would you use a raid to place surveillance gear? The device shown in the photograph is surely not meant to be taken out of the vehicle to be placed somewhere. It is meant to remain in the vehicle. Why then bother with creating a lot of attention with a military operation if the goal is to place surveillance gear and a single person could drive the vehicle to the destination and park the vehicle at the intended location? I would say the equipment was part of the raid in the sense that it was used to locate the target person(s). It may not have been the intent to leave the car and the equipment behind but if you operate in enemy territory you usually take into account that you are forced to do it. If this is truly the com/surveillance gear then the IDF did a pretty bad job in destroying it. I don't have a clue enough to guess but agree they did a bad job of destroying it. I can't ask more than wonder if it's old kit and they didn't expect running into a problem? It sounds daft but what if they wanted somneone to acquire this? Is there a plausible reason why this would be so? "The tires in the last photo are half hidden in the dirt. Park your car, set it on fire and look if it digs itself in by 10" just by burning." They can and they do. Look, if you choose to, at some of the plethora of pictures from the recent California wildfires. You will find cars in all sorts of interesting ways, and yes, sometimes burnt out with happy shrubbery beside them. Fire can do weird things. I guess all such surveillance devices should have embedded self-destruction capability in a case of similar unsuccessful operation or/and unauthorized access. Moreover, as I recall some electronics (many years ago in ussr) was placed in kind of epoxy cover around making unit as a brick difficult to do reverse engineering without destruction. Self destruct devices, realy are not liked for many reasons, not least for their unreliability in various ways. One of the reasons the so called "black box recorders" are switching over to "all solid state" is that chips are just to difficult to destroy... Likewise artillery shells woth massive G-Forces are using more and more solid state electronics for fusing systems. One of the reasons behind the "going dark" encryption issue is to do with chip survivability in the likes of explosions. From the LEO perspective data that can be gained from devices used by bombers as part of the fusing and triggering mechanisms is desirable. Most but not all consumer electronic devices are realy not designed to be secure in the right way, including the likes of Solid State Hard Drives with inbuilt Full Disk Encryption. As we find out every so often when researchers buy a bunch and "put them under the microscope" and publish their results. But there are other issues with "self destruct" in that do you realy want to "sit on a bomb", or have it accidentally go off when a stray bullet hits the device it's built into or even just gets dropped? The reality is, the more "fail safe" you make a "self destruct device" the more likely it is to go off. That is "fail safe" in such a device realy means "blow up on even more environmental factors" because the design focus is protecting the secret at all costs... Which includes those using the equipment as well as the equipment it's self. Thus "Catch 22" comes into play. It's one of the reasons the likes of the SigInt agencies like GCHQ, NSA, et al have "Crypto Ignition Keys" and "Key Fill" devices such as "punched paper tape". The correct design ethos is to make the system solid, and reliable to the point of surviving a close by nuclear blast, if it cannot survive this in a functioning state it should not be on the battlefield. But... design it such that the encryption KeyMat is on a removable device or can be "zeroed" with the press of a button, loss of power or half a dozen other easy ways. You then implement appropriate "KeyMat handeling proceadures" to do fast refill from "blue tape" etc. There are proceadures for "Re-keying without KeyMat" and for "Obtaining KeyMat without secure comms" such as over an Engineering Order Wire (EOW) or open voice circuit. They are basically manual processes that use a One Time Pad or similar as a bootstrap. But they are at best slow and laborious and not something you want to do by yourself. Have you seen photos or film from Gaza recently? There is no one in the Isreali Army dim enough to imagine they might park a van unnoticed anywhere in Gaza. And equipment decorated with Hebrew text! On the other hand, Isreali citizens are brighter than Americans. It is probably a the-sky-is-falling-pump-up-our-budget. @Clive: "But there are other issues with "self destruct" in that do you really want to "sit on a bomb", or have it accidentally go off when a stray bullet hits the device it's built into or even just gets dropped?" Clive, thank you for your input on that, but I was thinking about kind of chemical-type destruction when acid/other solvent could dissolve critical element not harming folks around. Yeah, you right that accidental activation is always possible - but that is up to cost benefit analysis which is different in case of the battle field or compromising IC operations. An old Russian Jew was sitting alone in a railway carriage with his shopping bag when a Russian officer entered the carriage and sat down. After a while he opened the conversation, saying, "How come all you Jews are so smart?" "Oh, it's simple," the old Russian Jew said. "We chew raw fish heads." Then he looked into his shopping bag and said, "Well, guess what, you're in luck! I've got a raw fish head here, and I'll sell it to you for three roubles." The officer duly bought the fish head and sat chewing it, then suddenly said, "I could've bought a fish head for eight kopecks!" "You see," said the old Russian Jew, "it's working!!!" The IDF is filled with fish-head-chewing bureaucrats wondering if they can remember how to make fish soup. Each one sells fish heads to the next, and buys them from the previous. Then they enter the Knesset and spend the rest of their careers trading and chewing fish-heads. Chewing fish heads for three roubles when you could've bought them for eight kopecks is a function of power, not ethnicity. "One of the reasons the so called "black box recorders" are switching over to "all solid state" is that chips are just to difficult to destroy"
Yet a new bottle for sour wine? So it's "Put up or Shut up time", you will need to quote with valid citations within 24 hours why you regard my statment as inaccurate or non factual. I suspect your Ratio of success to remain low as always. panel." My guess is that this was some kind of integrated communications solution for a mobile command post. Yup, in the first photo they were two indistinct to say for certain but the second photo @Jeremy Ardley links to makes it a lot easier to see. There is rather more cabling than you would expect for just audio comms. Originally the radios were made by Racal in the UK, before they got taken over by Thales. They were quite advanced for their time covering 30-512MHz as a Software Defined Radio, but they were rather deaf at only -116dBm and had a quite unclean harmonic output at -47dBc. Modern radios systems for civilian use you would be looking for -126dBm and over neg fifty for harmonic output and better than neg eighty across the rest of the band.